What happens when you hear a song that returns you to another time—and the memory of an earlier love who still lives within your heart? ENTER the lives of twenty-eight women and men as they tell their heartfelt stories about what they do with fond memories and feelings about former loves—within current partnerships. RECOGNIZE the hesitation that accompanies thoughts of disclosing your heart’s journey to your partner—and your reluctance to hear something heartfelt about your partner’s past love. JOIN the authors as they reveal personal stories of their journey in a second marriage. 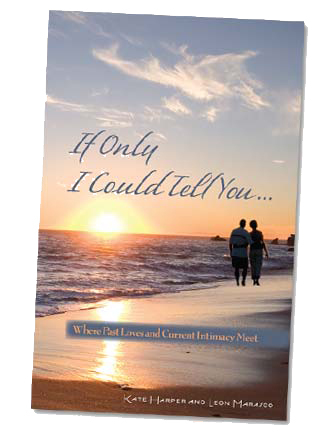 Learn from their reflections on comparisons, love and loss, soul mates, and the nature of intimacy. DISCOVER why heeding the conventional wisdom—which advises "Don’t do it" (don’t share what has heart and meaning from a prior love)—may inhibit the emotional intimacy that is possible in your subsequent relationship. AWAKEN to more conscious choices in this challenging aspect of relationship intimacy. Until now, there has been little useful guidance regarding how (or if) to talk about past loves when in another significant relationship. what couples lose if they follow, without question, the conventional wisdom that says, "Don’t talk about past loves"
In their marriage, Kate and Leon came to understand that their desire to know and be known could not be fulfilled if they did not fully share their feelings of love and loss from significant earlier relationships. Once they discovered how much their own emotional intimacy had deepened through having taken the risk of walking through those intense feelings, they began to wonder what others did with hidden truths about past loves. They decided to ask. Their searching interviews with twenty-eight women and men became the basis for their book, If Only I Could Tell You: Where Past Loves and Current Intimacy Meet, and supplemented their understanding of how past loves become part of one’s journey toward self-knowledge and deeper intimacy. As partners who, together, fully engage with their memories and feelings, Kate and Leon have opened realms of the heart not available even with a close friend or a therapist. That experience, coupled with the many stories they heard from others, informs their discussion of the complex role of past loves in current relationships. Kate Harper and Leon Marasco have found an interesting and significant subject: not only the importance of past loves, but the nature of intimacy itself. The book would be worth reading for the interviews alone, which are both moving and profoundly thought-provoking. Denying the importance of one's past loves, it becomes clear, is not only one strike against any present love and the struggle for intimacy, it's also a strike against the unity of the self.